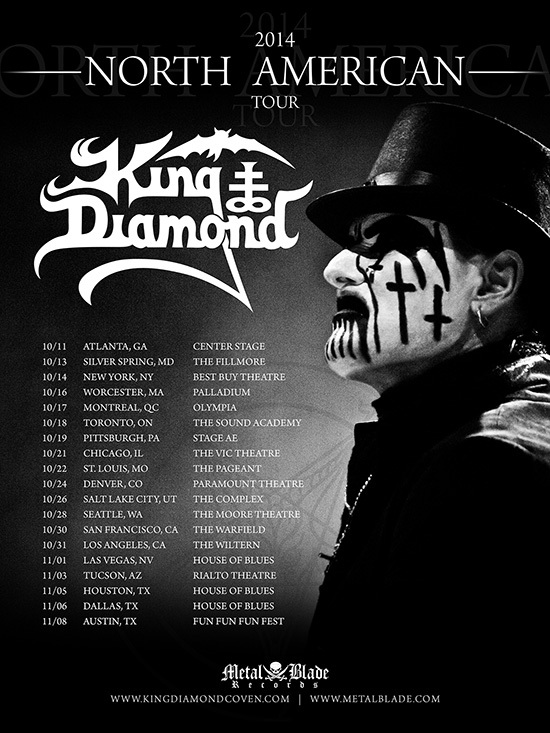 About two weeks ago or so it was confirmed that King Diamond would in fact head out on a full North American tour in the fall. This had been rumored for quite some time after it was confirmed that King Diamond and his band would be appearing at Fun Fun Fun Fest. Metal Blade says that this will be the full European festival stage show experience, and is planned to be the most ambitious production they have done in North America. A special opening act will be announced in the near future. Check below for the full list of dates! 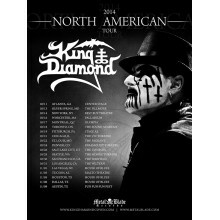 Agoura Hills, CA – June 23, 2014 – King Diamond has confirmed what has been rumored for several weeks: the band will return to North America for a full tour this Fall! The tour will wrap up with the previously announced performance at Fun Fun Fun Fest in Austin, TX, and begins on October 11 in Atlanta, GA. A limited edition King Diamond jacket will be available through the SHOWstubs.com fan club presale, which begins tomorrow, June 24th. Tickets will be on sale online and at box offices nationwide on Friday, June 27th. King Diamond will be joined on stage, of course, by long time band members Andy LaRocque, Mike Weed, Hal Pacino, and Matt Thompson. Additionally, North American fans will be bearing witness to the band’s full European festival stage show. These will be the most ambitious and largest productions in North America in the band’s entire history. A special guest supporting act for the tour will be announced at a later date. IN SOLITUDE full European headliner tour announced with BEASTMILK and OBNOXIOUS YOUTH as supports! Amon Amarth to return to North America this fall with Sabaton and Skeletonwitch!